Just one problem: The document was created with certain administrative limitations, meaning I couldn't perform any editing on it. My only recourse was to print the document, complete it by hand, and then scan it back in. What is this, 1993? That pretty much defeats the purpose of an electronic document. Fortunately, there's another option: use a PDF reader that allows editing even when the PDF itself does not. There are a few that offer this capability; I'm partial to Foxit Reader, which, among other things, lets you add text to any PDF. The first time you run Foxit, it'll ask if you want to make it the default PDF viewer. That's entirely up to you, but I find Foxit to be smaller, faster, and less intrusive than Adobe Reader. If there's a downside, it's that it doesn't offer quite the same level of security--a problem only if you're working with sensitive documents. 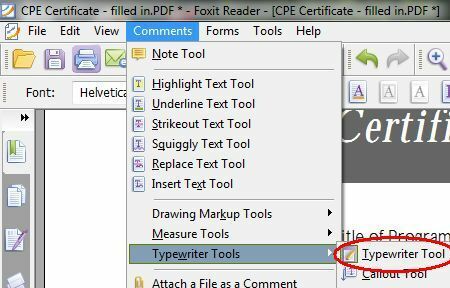 To edit a PDF, start by opening it in Foxit instead of Reader. Next, click Comments, Typewriter Tools, Typewriter Tool. Now just click wherever you want to add text, then start typing. (The program offers other markup tools as well, in case you're interested.) When you're done, you can save, print, or e-mail your marked-up document. Foxit Reader is free, but be sure to decline any extra toolbars or the like it tries to sneak in during installation. If you've found a PDF-editing solution you like better, tell me about it in the comments.